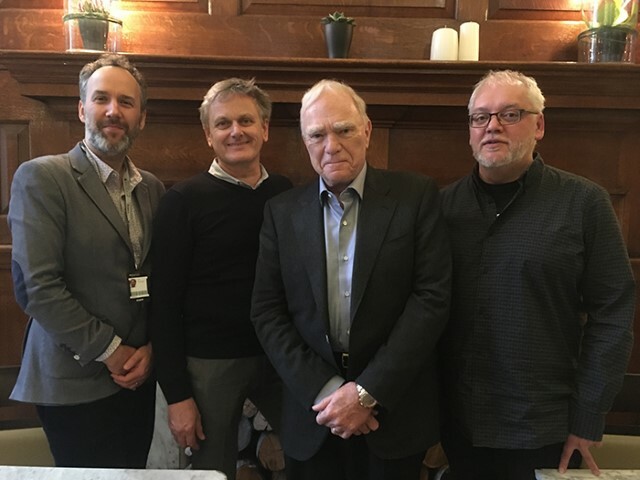 From left to right: Neil Herrington, Head of Student Recruitment; William Harris, Head of Programmes, Film, Media & Performance; Robert McKee; Phil Hughes, Head of Programme, BA (Hons) Screenwriting & Producing. McKee, a Fulbright Scholar, is the most sought after screenwriting lecturer around the globe. Providing consultation to film and television companies such as 20th Century Fox, Disney, Paramount, & MTV, his screenwriting courses have been taught in almost 40 cities worldwide, and to notable Oscar winners such as Peter Jackson, Jane Campion, Akiva Goldsman, and Geoffrey Rush. In fact, McKee alumni have thus far won over 60 Academy Awards, 200 Emmy Awards and upwards of 100 Writers Guild of America Awards. McKee’s Channel 4 special, J’accuse Citizen Kane, won the BAFTA for Best Arts Program, 1991. His classic text, Story, received an International Moving Image Book Award. Last year, he was inducted into the Hollywood Hall of Fame, joining industry peers such as Lawrence Kasdan (Star Wars, Raiders of the Lost Ark) and Steven Zaillian (Schindler’s List, Gangs of New York). The award, worth £7,000 per year, will be given to one student who enrols on the BA (Hons) Screenwriting & Producing programme each year. An additional award, worth £3,000, will also be given to one student each year on the MA Writing for Screen & Stage programme. The successful scholars will need to have already been offered a place on their relevant programme, before submitting a 500 word statement on why the scholarship would be important to them. On top of reduced tuition fees, the successful scholars will be given complimentary places on the Robert McKee Story Seminar, as well as free attendance at the London Screenwriting Festival, which has been hosted at Regent’s for the last few years.